MEXICO CITY, Jan 6 (Reuters) - A vicious Mexican drug gang forced some members to eat the hearts of murder victims as part of a gruesome initiation rite to root out infiltrators, a government security official said on Tuesday, citing witness testimony. For much of the past year, Michoacan, a mountainous, agricultural state in western Mexico, has been ravaged by fighting between drug gang henchmen and vigilantes who took up arms against the cartels but have since splintered into violent factions. A mid-December shootout between two rival groups that killed 11 people has reignited fears the government is failing to control the state after flooding it with federal troops and pressing vigilantes into a fledgling rural police force. The renewed fighting in Michoacan comes as President Enrique Pena Nieto faces his deepest crisis since taking office, following the apparent murder of 43 trainee teachers by a drug gang working with corrupt police in neighboring Guerrero state. The incident sparked widespread protests against the government, compounded by conflict-of-interest scandals enveloping the president and his finance minister. Pena Nieto was expected to discuss Mexico's chronic violence with U.S. President Barack Obama in Washington on Tuesday. 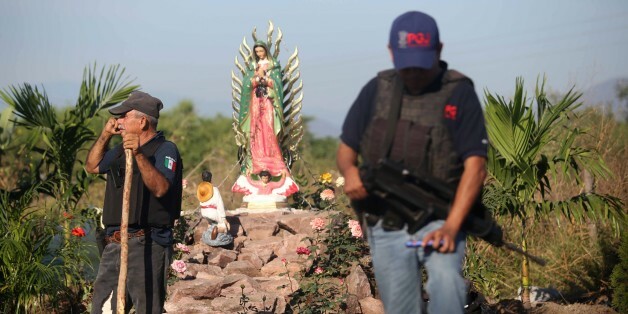 The main gangs operating in Michoacan, La Familia Michoacana, and later offshoot the Knights Templar cartel, were founded by Nazario Moreno, or "The Craziest One," a cultish crime boss who was finally killed in March 2014 after the previous government declared him dead in 2010. Interviewed on local television, Alfredo Castillo, Michoacan's federal security commissioner, denied cannibalism was widespread, but said there were various testimonies indicating heart-eating was part of a macabre initiation Moreno used to root out moles or test his men's loyalty. "The ritual ranged from dismembering people they intended to kill to sometimes serving up the heart," Castillo said. He did not elaborate on who provided the testimony and did not specify when and where the alleged initiation rituals took place. Castillo could not immediately be reached for comment. More than 100,000 people have been killed in gang-related violence in Mexico since 2007.